The House of Medici was a political dynasty that came into prominence in the 14th century. Having acquired great wealth first in the textile trade and later as bankers, the Medici family became the unofficial rulers of the republic of Florence, and later the recognized sovereigns of Tuscany. When the family was overthrown in 1527, Catherine was taken hostage and placed in a series of convents. After Florence surrendered to Charles V in 1530, Pope Clement VII (Cardinal Giulio de' Medici) helped arrange Catherine's marriage to the future King Henry II of France in 1533. "I ask you, what could a woman do, left by the death of her husband with five little children on her arms, and two families of France who were thinking of grasping the crown - our own [the Bourbons] and the Guises? Was she not compelled to play strange parts to deceive first one and then the other, in order to guard, as she did, her sons, who successively reigned through the wise conduct of that shrewd woman? I am surprised that she never did worse." She died in January 1589, at the age of 69, probably of pleurisy. 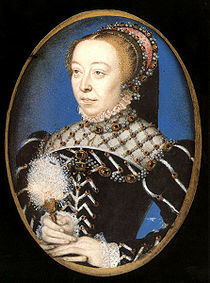 This "beyond the book article" relates to The Confessions of Catherine de Medici. It originally ran in August 2010 and has been updated for the May 2011 paperback edition.